Welcome to the Exponent blog! We began this blog in an effort to support the Exponent II magazine, which for years has provided a forum for Mormon women to openly and compassionately share their diverse experiences with each other. Begun in 1974 in the midst of the women’s movement, this independent Mormon women’s magazine continues to feature personal essays which often highlight women’s concerns. 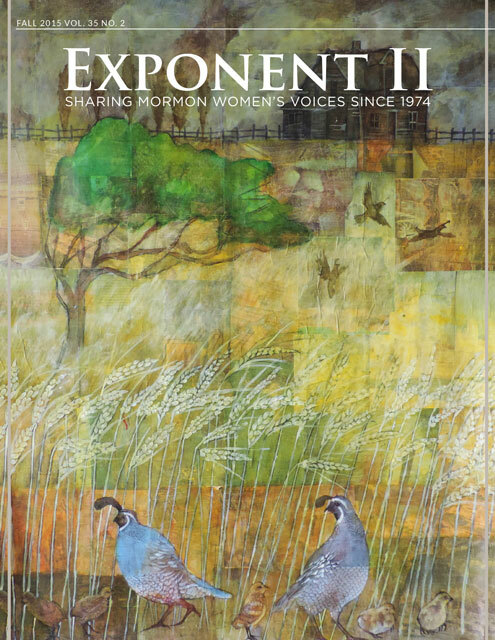 Just as Exponent II frequently quoted and republished original articles from The Women’s Exponent, this blog will frequently feature seminal articles from the Exponent II. We hope that LDS women and Exponent II readers will share their insights and reactions so that we might empower each other through our diverse experiences. Hey, how do I submit a guest post? email us at exponentblogATgmailDOTcom. We’re excited to see it! Janice, that lesson should be up any day now. I am subbing in Releif Society this Sunday and I see that Camille has a lot of neat ideas. Camille, could you send me your outline too! I was just released from Primary after 15 years of not going to Relief Society and I need all the help I can get! Heidi, the apostasy lesson is up. If anyone has any thoughts on Lesson 28 about missionary work, please share. ASAP!! Has anyone got any ideas for lesson 29? lesson 29-Just as the prophet Joseph Smith was a peacemaker so can we. I took an assignment given by a bishop and used it for the R.S. ladies. I chose 3 ladies for the next two weeks to be peacemakers where ever they go and to come back and report in R.S. about being peace makers. I then used the story from the manual about Joseph Smith being a peacemaker. I have based my lesson around this theme. I really find the relief society lessons helpful but it would be even nicer if they could be posted a little sooner. Maybe our ward is ahead of the game but often the lessons are only posted a few days before I have to give it. Definately better than not but it sure would be great to get them a week or two earlier. Thanks for the great site and input!! May I get your ideas for lesson 29 as well? How do I get a hold of you? Lesson 29 is up now. I’d love to help but due to this website you aren’t allowed to post email addresses. Is there a way that you know of to give you this information? Okay need help with Lesson #30 in J. Smith Manual ASAP! Any help would be great, It’s “Standing Valian in the Cause of Christ” and I’m not really sure how to go about it. HURRY!!!!!!!!!! Hello, just looking to see if anyone had some suggestions for lesson #26 Elijah and the restoration of the Sealing keys? I think we are behind everyone else. Thanks for any help. I would LOVE to submit work (I’m brimming with ideas! ), but looks like summertime & Xmas break are the only times I’m not crazy, dizzy-bizzy with semester teaching. Has anyone taught lesson 32 yet that has some ideas to share? Heidi, lesson 32 is up. Just go to our home page and scroll down to the bottom. You’ll see it listed there in our recent posts. This is an excellent website. I love all of the ideas on presenting the RS lessons. I just had surgery and was working on lesson 39. I decided to do a big quiz. I divided the room into 2 teams The sisters loved it and learned a great deal. Any helps out there for lesson41? decided how to use the article but it may give you some ideas as it has helped me to begin my preparations for this lesson. Thank you Alisa for lesson 43. It helped me personally to focus on my mission and I just received an email from someone in our RS class yesterday and she went home to read her patriarchical blessing to identify her mission. It was a great lesson objective that I would not have thought of myself. Thanks. I’m teaching this sunday from the Ensign, General Conference talk ( Elder Richard Scott)any ideas. Hi Raquel, sorry, we only do the lessons from the manual because the fourth Sunday lessons are up to the bishops to choose. Have you tried sugardoodle.net? Good Luck! I just got called as a RS teacher and I teach the 2nd week. Chp 45. I really don’t know what I am doing and how to go about it. Any help would be great! Jamie, just go to the top right of the blog and type in ‘lesson 45’ in the search box. It will pop up then.